Dating The Greens And The Nutty Seeds: The Peanut Butter Smoothie! My cute 12 year old son helped me name and post this smoothie. He wisely advised me that giving my recipies book-like titles would make them far more interesting. Don’t be fooled by the color of this smoothie, which happens to be a vibrant green. This really tastes like a creamy peanut butter smoothie. It just packs a bunch of extra nutrients without sacrificing taste. 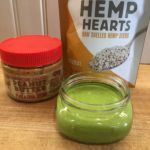 The recipe is simple: unsweetened almond milk, peanut butter, hemp seeds, avocado, spinach (this where it gets its vibrant green), and of course, the DATE!